PLEASE NOTE: The item is customizable. 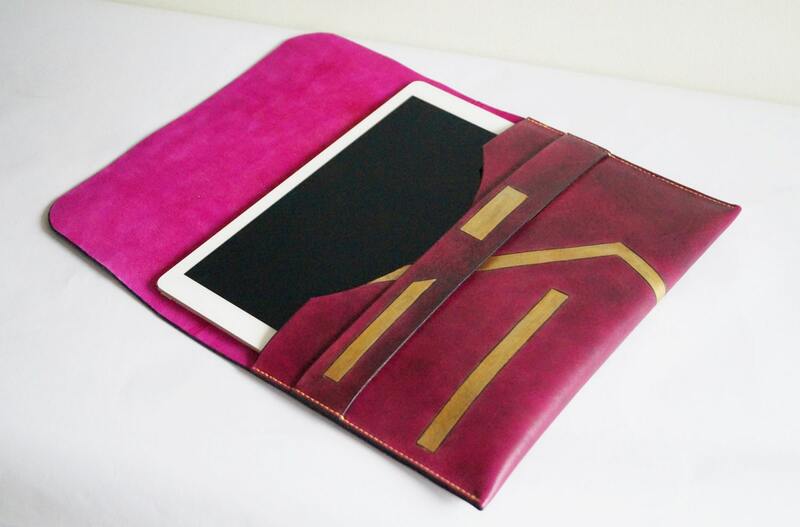 It can be made to fit any kind of tablet. The price given is for a large iPad Pro. If you want the item for a smaller model, there will be a price reduction. Please, contact me for details. This iPad sleeve is made of high quality vegetable-tanned leather. All the work has been done by hand in my small home studio. I use professional quality tools, dyes and finishes. It has a simple and yet sturdy construction and provides good protection. The case closes with a flap that goes under a leather strap, easy to open and close and without hardware that can scratch the device. A wider cut at the opening allows for easy access, your device just slides in and out. I have chosen a beautiful cyclamen color for the model, combined with some simple decorations made in a golden color. The edges are nicely done, coated and polished. The item is stitched together by hand using strong waxed thread. Everything is made to last. Before shipping, I will treat the item with leather fat, it gives a great smell, softness and a beautiful shine. Very appealing design and an original look that will complement your device and will not go unnoticed. I spent 3 months searching and researching the perfect knife case for my individualized knife set. I stumbled upon TeLeather, and I am so thankful I did. Dimitar was able to fulfill my request to customize a case, so I could safely travel with my knives. The case exceeded my expectation. In addition, Dimitar is a pleasure to work with. He is communicative, easy to work with, and professional. To be honest, I will go to this shop for any of my future leather needs. I could not ask for more. I now have a unique piece that is not only functional, but also makes an artistic statement. I am overjoyed and thrilled by the end product. Thank you! Great item, was exactly what I wanted, really happy with purchase!! TeLeather accepts credit and debit cards, Etsy gift cards and other international payment methods where available. If you in some way are not satisfied by the item you have purchased, feel free to return it at your own expense within 30 days after you received it and I will refund your payment. If the item has customization, I would appreciate if you contact me first, so we can discuss possible solutions. I will ship an item as soon as the production process is finished. This can vary for the different items, but I love my work and I usually start working on a project immediately, finishing it in very reasonable time. Holidays and weekends are not included in the production time. The preferred shipping option is first priority airmail without tracking since it is cheaper. You can choose to order a shipping upgrade and have your item sent with a tracking number, so you can follow its whereabouts. Delivery within Denmark will usually take 2-3 days. Deliveries to the European Union should take not more than 2 weeks. Deliveries to the United States and elsewhere can in some cases take up to 3-4 weeks. An item is considered lost if not received 45 days after shipping. Please note that taxes and duties incurred in the respective country of delivery are the responsibility of the buyer.